Shawn Sheehy is an artist with a love of ecology who enjoys exploring such themes as interconnectedness, adaptability, and evolution. Passionate about pop-up books, he works sculpturally with the book format and has presented numerous workshops on pop-up engineering across the country. He lives in Chicago. This beautifully crafted pop-up introduces a spectrum of wildlife residing together in the same “neighborwood.” ... Sheehy carefully links one neighbor to the next until they are brought together in an impressive final display of their shared habitat. Readers will find lots to delight in and learn in this gorgeous book. Sheehy makes an impressive children’s book debut, using dramatically unfolding pop-ups to introduce seven woodland animals with special construction skills of their own.... A visually striking and enriching overview of animals living independently and as part of an ecosystem. An auspicious debut, imparting a worthy message in playful language and harmonious, sophisticated paper design. The new standard for pop-up books is sky-high, and this ingenious introduction to woodland ecology is up to the challenge. Providing an intriguing peek inside an ecosystem, this book enchants even as it instructs. If your children love learning about animals but don't dig them in glass cases, "Welcome to the Neighborwood" is for them. No question, if you love Pop Up books and the natural world—grab a copy of this book now. It’s sure to be a classic! 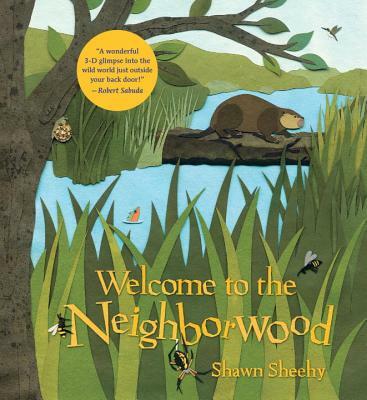 A brilliant offering, “Welcome to the Neighborhood” will have kids (and adults, too) thinking about nature and how intricately involved animals and humans are with the balance of life.